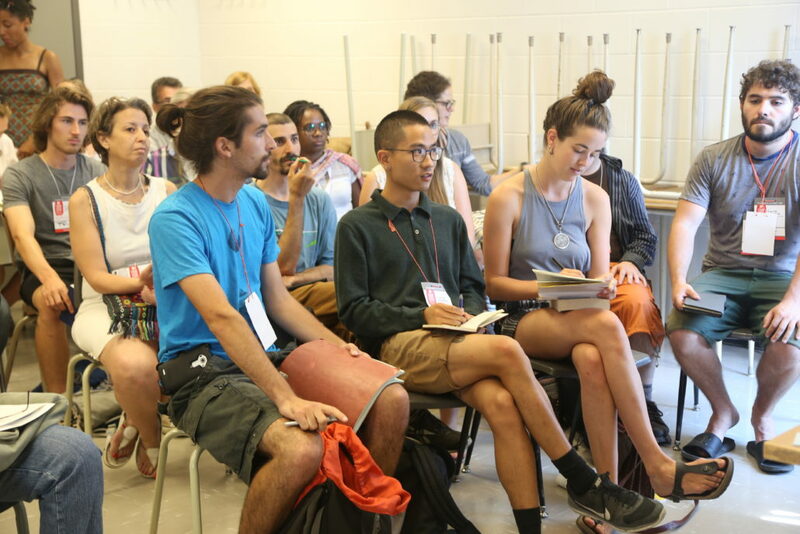 This summer, COCo collaborated on a workshop at the World Social Forum (WSF) called “Putting our values into practice through non-hierarchical management”, with Inter Pares and the Réseau Québécois des Groupes Écologistes (RQGE), two other community organizations who also use a horizontal management structure. The workshop was standing-room only, and attracted more than 50 participants of all horizons. Together, we used our own histories and motivations for moving towards a flat structure, to navigate a wide variety of audience questions about governance, human resources, salary equity, and meeting facilitation. The popularity of the workshop might have to do in part with the context of the WSF, a forum with a strong interest in challenging the long-standing hierarchical structures in our sector and in our society, and the neoliberal, partriarchal, and otherwise damaging tendencies those structures represent. To consider applying non-hierarchical practices in our organizations is to consider, in a certain sense, a model that favours process over “productivity at all costs”, and equity over entrenched power. Here are 5 takeaways we can share about our exchange with participants at the workshop. Building trust and a nurturing a culture of open and constructive feedback is key! Supporting and addressing performance issues, unhealthy group dynamics or interpersonal conflict quickly is also key in non-hierarchical structure. When this is no longer the responsibility of the ED/Board, it’s everyone’s! How comfortable are you raising issues or problems? Have you ever been emotional or supporting someone going through a tough time at work? Are there repercussions, or other responses, for when someone isn’t fulfilling their responsibilities? While and an HR/personnel committee can help move policies & procedures forward, coordinate work plans, plan retreats, and initiate regular evaluations, it is equally important that everyone be able to have one-on-one conversations for folks to express frustration or readjust expectations BEFORE issues snowball to another level. Transitioning to a well oiled horizontal structure takes time and commitment! Is the timing right? Have you got the right people on your Board? Have you had conversations internally and externally about this? Needless to say it’s important to have fun, celebrate successes and learnings throughout! There is no such thing as a perfect horizontal or more hierarchical organization. Having a desirable future, not having a dead-end job! How would each person rate their positions based on these criteria? Can things be tweaked, or do you need to restructuring existing positions? What would your Board, members or partners need to Board/membership/partners need to understand for them to support a shift in the organisation’s places of power? The workshop was facilitated by Parker Mah and Sabrina McFadden from COCo, Guillaume Charbonneau and Samantha McGavin from Inter Pares, and Aurélie Girard from the RQGE. This article was written by Parker and Sabrina!